Home Biafra featured Biafra: Who Is Nigeria President, Late Buhari, Clone Juril Or Abba Kyari? 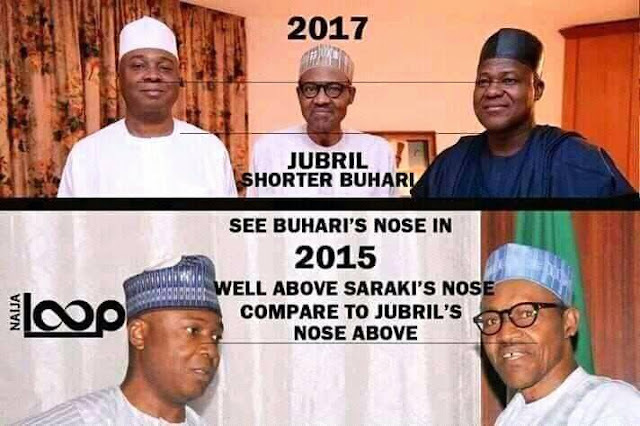 Biafra: Who Is Nigeria President, Late Buhari, Clone Juril Or Abba Kyari? Every mature mind can agree with me that Nnamdi Kanu, the supreme leader of IPOB is so kind to Nigeria, should he flattery accordingly to equate criminality committed by both Buhari and clone plastic Jubril to retain power against collective aspiration of Nigerians, he deserves more than exposing the hidden truth swept under the carpet. He never asked much just those cabals controlling Nigeria government to package that thing and send it back to Sudan where he came from and convey a national unity to usher in referendum to allow Biafrans to decide their fate either to continue living with Nigeria or to opt out, it is unforgivable betrayal of a people’s trust to arrange a foreign impostor to assume the highest office in the land and flex another man’s wife contrary to her voluntary will. By the way, Is it not ironic those born in 1983, when late Buhari forcefully overthrew a democratic dispensation after 35 years the child now a man watching the same coup plotter cloned to continue to seize power after his death? Unlike Nigeria, this kind of gerontocracy / dynastic system revolving among analogue cabals ought to have stirred up uprising to address the ugly situation. Despite all of that, futureless Nigeria youths keep mute in fear of protecting their rights. The present scenario is nothing but a systematic overthrown of a legitimate democratic government that must be resisted through a revolution in order to change the barbaric status quo. No further argument, evidence showed Nigeria is worst than evil forest where uncountable strange misfortunes happened. The position of IPOB that Biafra agitation has gone Rubicon to contemplate backing down (point of no return) some thought it was a mere talk without anything to show for, at a moment Nigeria seat of power is panicking to the extent presidency pleaded Israeli government to repatriate Nnamdi Kanu, back to lawless slave camp called Nigeria to continue face trial in exchange of recognition of Jerusalem as their capital city. Disappointedly, it was dead on arrival rather, Israeli government anchor succour with an official license to set up Radio Biafra in her capital knowing very well peaceful agitation for freedom is a hallmark of democracy accepted by all responsible countries of the world, it did not contravene international law. Shamefully, Nigeria government never sue Erick Joyce, the British parliamentarian and a lawyer who first broke Buhari’s dead rumour up till date the alleged impostor is yet to debunks the accusation like former president Olusegun Obasanjo’s dead rumour was address by him saying “ I dey Kampe”. Boko Haram leader, the dreaded terrorist group adds their voices reminding late Buhari’s wife Aisha to respect Sharia Law that forbid her romance or move around with another man, in disguise of being Buhari. Can northern cabals sue Shekau Abubakar? This shows everyone is aware of Buhai’s dead yet, secret politics among northern leaders to concentrate political power for themselves is more important than relinquish power to vice as constitution demands. Notwithstanding, it is morally unjustifiable cabals forcing late Buhari’s wife flexing around with another man against her believe making people seeing her as an irresponsible woman. She was once acknowledged as a homely woman that belongs to the kitchen, room and other rooms by her late husband. The assassination of Habibu Almu, a Sudanese diplomat who arranges the clone imposter indicates the cabals were behind his sudden death to avoid trace. These draconian political gimmicks make Nigeria centre of attraction by the world, many countries beam their satellite reporting Buhari’s dead, so unfortunate Nigeria remains mute making their clone president stands still like the moron he neither moves forward nor backwards. Worst of it all he was mocked by formal president Olusegun Obasanjo, for developing a phobia for a public appearance, at Goodluck Jonathan’s Book Launch in Abuja. This show of shame restricts him from public appearance to address people or attend public occasions. Too little too late for 80 years old Abba Kyari and his criminal gangs to continue hiding the truth after every lying hidden loophole has been exposed by intelligent units with forensic evidence to trash their political shenanigans. DPRK news Service on their official site reported: “Nigeria calls snap elections to replace deceased president Muhammadu Buhari in 2019”. Who is deceiving who? Myopic Information Minister Lai Mohammed with his laughable senseless speech that doctors advised Zoo clone president strongly to stop wearing shoes with high heels Invariably, vindicates IPOB leader on physical structure differences of the late president.